The Chinese Hibiscus is an evergreen shrub that would, if conditions were suitable, keep growing all year. Evergreen shrubs are treated differently from those that are deciduous. They may be pruned at any time to control the growth. Why Prune. The objective of pruning is to modify the growth of the plant to fit the space in the garden, and to produce new wood for better flowering. After a year or more under good fertilizer practices, the average hibiscus plant has produced a large amount of wood or branches. Often the plant has many sprawling branches that produce few flowers, or one or more verticals that spoil the look or shape of the plant. We prune to obtain a plant of the desired shape, to remove dead and weak growth and to encourage the development of strong new growth where we want it. Equipment Needed. First, make sure that you have clean sharp and adequate tools for the job, a good sharp knife for small wood, a pair of sharp pruning secateurs (spend the money for a GOOD pair and throw the old ones away! ), a pair of sharp lopping shears for cuts up to 2 cm (1 in), a sharp pruning saw for anything larger, and a can of plant pruning paint, grafting tar or grafting wax. Prune at the right time. 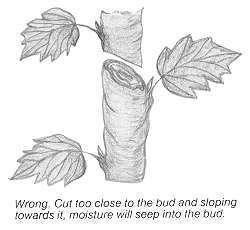 Prune to an outward pointing bud. Cut away all dead, crisscrossing and weak-looking wood. Make all cuts clean and smooth. Examine the plant and cut off all dead, diseased or injured wood, cutting well down into live green wood, and making the cut at a slight slant to shed water. All cuts a centimetre (1/2 in) or more should be treated with pruning tar. This coats the cut to prevent infection so that the cut can heal over without decay. Never leave a stub above a bud or branch. Always prune close because stubs will decay and cause trouble. Then remove small twigs and branches that cross and grow toward the inside of the plant. This is to give light and air to the interior of the plant and cut down on fungus and insect problems. Look carefully to find 2-3 eyes or buds above the previous year's pruning on the branch that faces outward of the profile of the plant. Cut at a slight angle with the bud eye on the high or upper side of the slant. This is called directional pruning. The strength will go to these topmost buds, growth will develop outwards, helping to keep the inside of the plant open for light and air. Obtain the rough outline or contour of the shrub that you desire. If this is an arching or drooping type of hibiscus, you should cut to an INSIDE or topside bud on each branch to create more vertical branching. 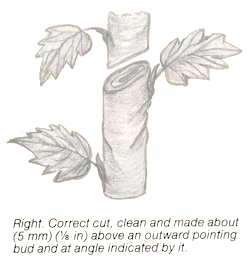 Cut out small intermediate branches. Remove all horizontal branches if you wish within 10 cm (4 in) from the ground, cutting close to the stem or trunk. 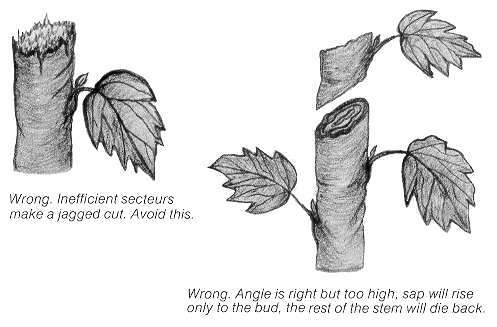 If there is a number of strong upright stems, shorten them by at least a third, and cut to a top or side eye or bud, never to one pointing to the ground. Remember that other dormant eyes will sprout branches below the cut. In a few weeks the new shoots will pop out with leaves. Then, apply a dressing of organic fertilizer or manure. With a few weeks of new growth, flowers will be there again more and better. The real old-timer bush that has large, old, hard wood produces small flowers because of the equivalent of "hardening of the arteries". The plant needs rejuvenation by drastic pruning. This calls for the pruning saw. On a many-years-old plant with branches 5-6 cm (2 in) through, it is best to saw them off to 30 cm (12 in) from the ground on a slant. A whole new hibiscus, bushy with nice foliage and better flowers, will result. It will take a little longer to recover than the younger plant previously described, but it will be worth it. After pruning particularly heavily, do not over-water. Because of the loss of leaf, the plants do not need and cannot cope with excessive moisture. At this time, do not apply nitrophoska or other chemical fertilizers. The reason being the same. The plants cannot take up the food. Apply a dressing of manure, mushroom compost and/or leaf mould. Organic material is an important essential part of growing healthy hibiscus and should be applied at least 5 or 6 times a year, with applications of Dolomite or lime at least twice a year. After pruning, (approximately 3 weeks) your plants should be showing lots of new growth. Now is the time to start with your chemical fertilizer. Remember do not apply to a dry plant. Water well the day before, apply nitrophoska or something comparable and make sure that the granules are dissolved. A sprinkler or hand hose should be used for at least 20 min to dissolve these. Do not make the mistake of applying chemical fertilizer after a light shower of rain. If there is a heavy downpour, 20-23 mm (75-100 pt), it's acceptable, but be careful!! Do not be too heavy-handed with fertilizers. A little and often is the rule. It should be applied each 2-3 weeks, during the growing period. The rate of fertilizer application depends on the size of the plant and according to directions on the fertilizer packet. Spraying for insect problems at this time is important as you don't wish to lose all your nice new foliage from grasshoppers and moths depositing larvae. Spray early in the morning while they are drowsy and not on the wing. As you will be using a contact insecticide, you have to spray the pest to get a kill. Regarding Black Pollen beetle, spray early and saturate your buds. Come back 5-10 min later. The beetles will be slowly crawling out of the buds by this time so you can spray them again using Thiodan, Bugmaster or Diazinon. Also, when using an insecticide, you could add a flat teaspoon of urea to 4.5 litres (1 gallon) of water to the insecticide. This will improve the size of your flowers and bush appearance. The question is sometimes raised about pruning back a hibiscus without spoiling its appearance or blooming. This may be done by selecting the longest third of the branches of the plant, pruning them out from inside the plant and cutting them down one half their length. Wait 30 days and cut the next longest third of the branches, and 30 days later cut the last third. This keeps the plant with shape, appearance, foliage, and bloom without that cut-back look at any time. When to Prune. Pruning should be done as early as possible - depending on how prolonged the cold weather is in your area. In Brisbane it is safe to prune mid to late August. In other colder areas, it may not be until mid or late September or, in some cases, October. Pruning can be done at any time during the warm weather, but if it is not done early you will miss a lot of flowering from your plants.